The aviators. The Amtrak. The ice cream cones. The memes. Few politicians are as iconic, or as beloved, as Joe Biden. 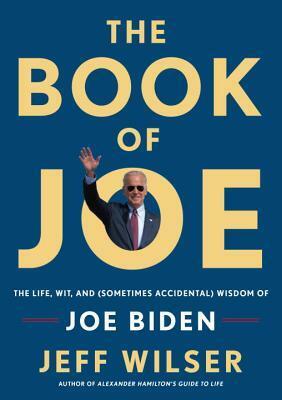 Now, in The Book of Joe, Biden fans will finally have the definitive look at America's favorite vice president--and what he can teach us. Structured around key moments in Biden's life and career--and filled with Biden-isms like "That's a bunch of malarkey" and "I may be Irish, but I'm not stupid"--this blend of biography, advice, and humor will reveal the experiences that forged Joe Biden, and the lessons we can use in our own lives. Along the way, readers will also encounter fun sidebars on his love of muscle cars, his most endearing gaffes, his bromance with President Obama, and much more. I'm pretty sure that I'm one of the least political people on this planet. It's not that I don't care, it's that I get completely overwhelmed and ....well, this isn't about me, is it? It's about this book and the fact that I am so glad that I followed my instincts and picked it up. If you've been on social media at all, you've seen the Biden/Obama memes and you've chuckled and perhaps even wished for a friendship like that. It made me curious to know more about our former VP and where he came from. Enter The Book of Joe. This fantastic biography shares with us the life of Joe Biden. It includes his hardships, his tragedies, and yes, his successes. I can't claim to know the man after reading it, but if he is anything like this book portrays him, I want to know the man. His love of family and his willingness to fight gave me an entirely new respect for a man that I only knew through memes. So, if like me, you're overwhelmed by politics and especially with what's happening now, take some time and read...well, for lack of a better phrase...of a better time. Read about the man, not just about his politics. It was well worth it and I would recommend this to anyone interested in politics, biographies, or even a bit of self-help. I received a copy of this book for the purpose of this review. All thoughts, comments, and opinions are my own. Now, I need to go write some of the quotes from this book onto my bathroom mirror.